Mark Cavendish won the time-trial prologue stage of the Tour of Romandie in Geneva, Switzerland in a time of two minutes 7.60 seconds. The 22-year-old Manx sprinter finished ahead of Italy's Daniele Bennati (2:07:87) and Swiss rider Michael Albasini (2:08:20). Cavendish's fellow Briton and Team High Road team-mate Bradley Wiggins was just under one second back in fifth place. Cavendish recorded an average speed of 56.425 km/hour over the 2km course. "The team is a fine mix of experienced and up-and-coming riders. It is impossible not to win," he said. 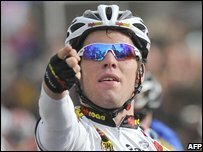 The victory is Cavendish's fourth of the season, and follows two wins in the Three Days of De Panne and one in the Scheldeprijs, in Belgium.